I can’t believe it’s been 2 weeks since the 2017 Space Coast Birding and Wildlife Festival. I apologize for the delay, but here are some photos and experiences I’d like to share with you. First of all, I scaled back a lot this year, primarily for budgetary reasons. Last year I had a packed schedule, with many night hikes and early mornings. I was completely exhausted and mentally spent. Since I had done a pelagic trip at the end of September of last year, I decided (after much hand-wringing) to forgo the offshore trip this year. This turned out to be a bit of a blessing, as I understand the Monday trip had to come inshore and essentially do a lagoon tour amid rough seas, wind, and frigid (for Florida) temperatures. In any case, I did three day-time trips, one night-hike, and a few side-trips for rarities in the area. That first trip was the Little Big Econ State Forest hike [map]. Now, you might be wondering what a “Little Big Econ” is. It’s a combination of the two rivers that flow near and through the state forest and the inclusive wildlife management area (the Little Econ actually joins the “Big” Econ southwest of the state forest). 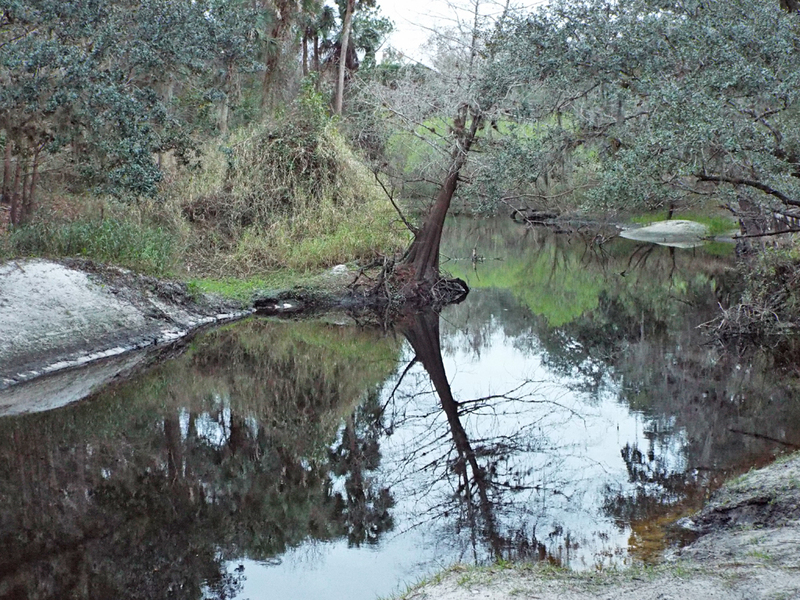 You can read about the Econlockhatchee River at this St. Johns River Water Management District page. We hiked in at the Barr Street trailhead. Along with other familiar faces at the festival, it was nice to see Bert Alm there. I met Bert at a Florida Master Naturalist Program class almost two years ago. Bert and his wife have gotten quite involved in conservation and wildlife rehabilitation since moving to the area, and it’s always a pleasure to see him. This is most of our trip group. Trip leader L0rne Malo is in the camo to the right, Camille is in the purple fleece at the center, and there’s Bert, in the aqua shirt and pale ochre vest, partly obscured. The Econlockhatchee River is a “black water” river, so named because of the tea-colored water, stained by tannins from organic sediments and particles. Like most typical black water rivers, the Econ (and Little Econ) are stained a dark brown from organics and have steep, sandy sides. In many ways the ecosystem here is similar to Turkey Creek (in Brevard County), which is a smaller black water river in a more built-up area. 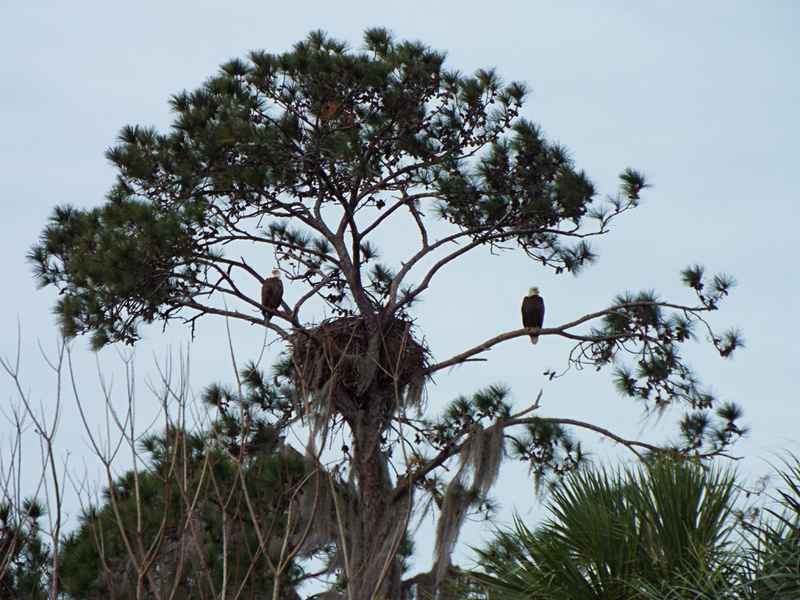 A pair of adult Bald Eagles near their nest. They raised a couple of chick this year, and one fledged youngster was still nearby. 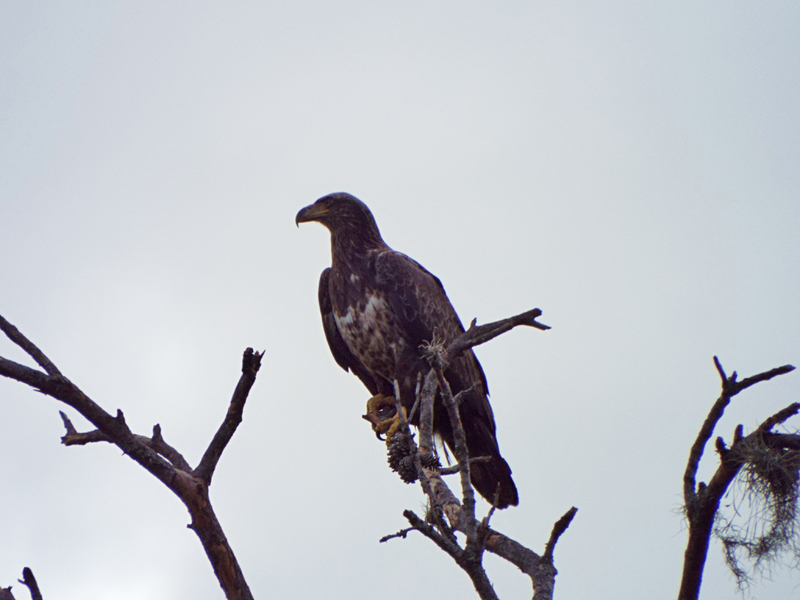 This Bald Eagle youngster had recently fledged and stayed in view of its parents. We had the expected winter residents, like Red-bellied and Downy woodpeckers, Blue-grey Gnatcatchers, Yellow-rumped Warblers, and more. There is one nesting Bald Eagle pair (see above). At one bend in the river I was surprised to see a Limpkin along the bank. 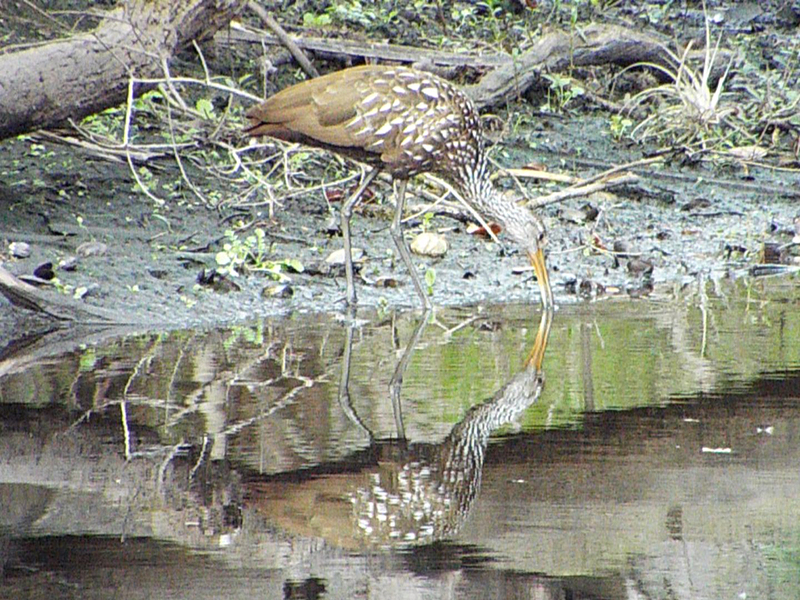 Limpkins eat Apple Snails (both the native and introduced varieties), which I did not think lived in rivers and creeks. This Limpkin found a stash of Apple Snails near the river bank. There was one surprise that cropped up when some of the trip co-leaders started “pishing” to call in some of the warblers and other small songbirds. 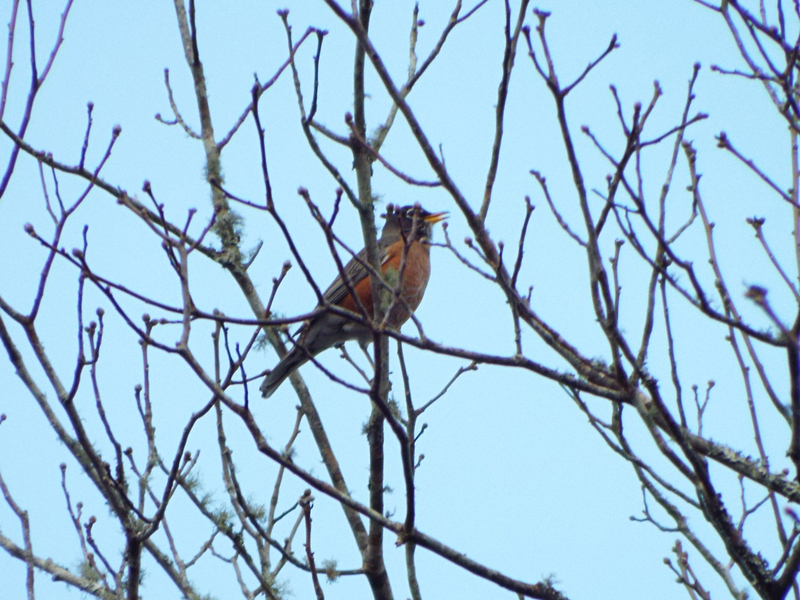 Along with titmouses, gnatcatchers and kinglets, a Blackburnian Warbler came into view high up in a mostly bare tree. It only stayed in view for a couple of seconds, but was long enough to get a look at the yellow-orange and black facial markings, as well as the sides and wings. This is extremely early for this species to be in Florida. Blackburnians winter over mainly in northern South America and Central America. Without photographic proof, this sighting won’t be “official”, but that doesn’t take away from the exhilaration and puzzlement of seeing it, for me. A more typical (but handsome) bird species for Florida winters, the American Robins will start leaving in a couple of weeks as spring returns. Throughout the morning, we kept hearing the cat-like calls of Yellow-bellied Sapsuckers (in fact, I think their call sounds more like a cat than Grey Catbird calls). It took a while, but one finally came in close and stayed for a photo-op. The red throat of this bird indicates it’s a male. Yellow-bellied Sapsuckers drill rows of holes to tap tree sap, which it licks up (along with any protein-rich insects that get in the sap). We hiked a total of about 5 kilometers (3 miles) on part of the Florida Trail and back before leaving the park. Most of the group then stopped at C.S. Lee Park (a small park and boat ramp off SR-46) [map] on the way back to Titusville where we saw some wading birds, among others, in the adjacent wetlands and flood plain of the St. Johns River. 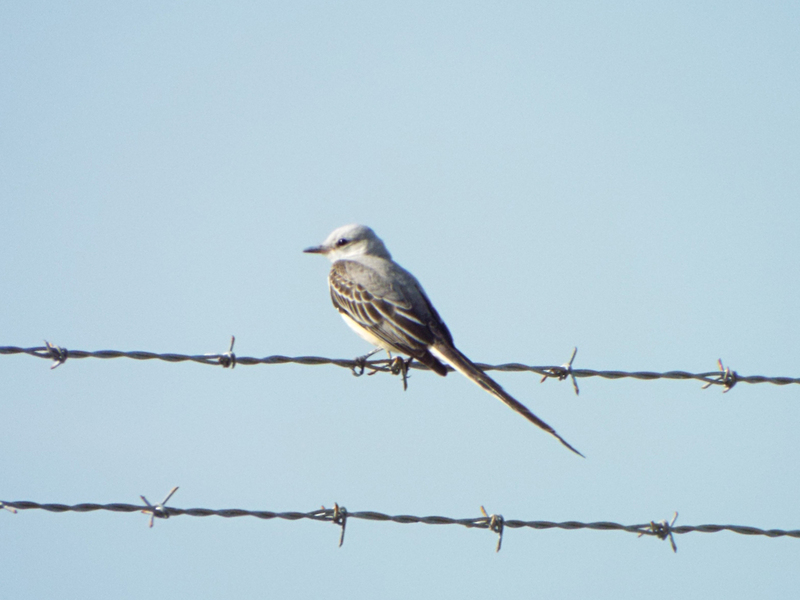 Since the day was only half over, it was decided to take a trip to the Space Coast Regional Airport [map] and find the Scissor-tailed Flycatcher. Mrs. Lonely Birder and I tried finding this bird before New Years, with no success. This time the bird was out, catching large grasshoppers on the airports barbed-wired fence! The relatively short tail of this bird indicates it’s an immature bird. Yes, believe it or not, adult Scissor-tailed Flycatchers have even longer tails than this. Bonus bird number one, and a life bird! 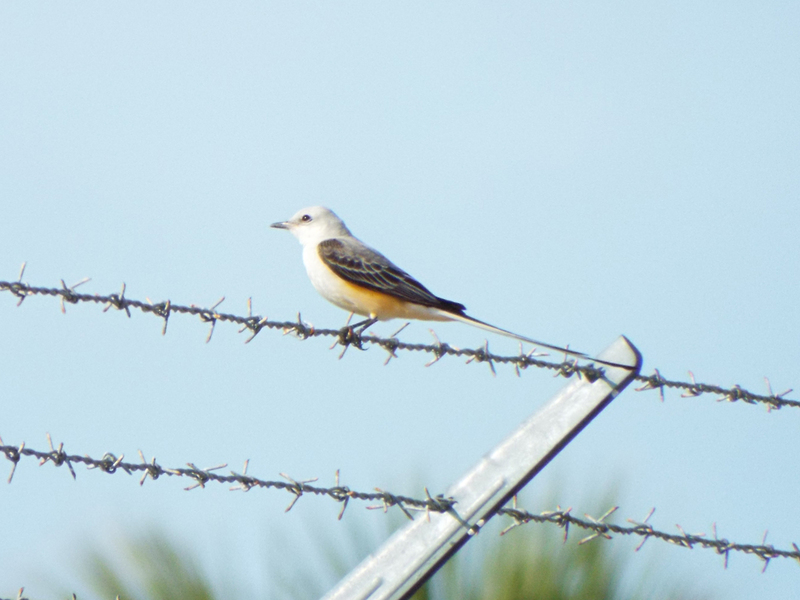 Scissor-tailed Flycatchers are rare but regular visitors to central Florida; there’s at least one every winter. As I’ve mentioned in this blog before, many flycatcher species have site affinity – that is, they often return to the same places year after year. If this bird decides this makes a fine winter home, we may have several years to look forward to seeing this bird as an adult! I was trying to capture the salmon colored flanks in this shot, but here it almost looks yellow. 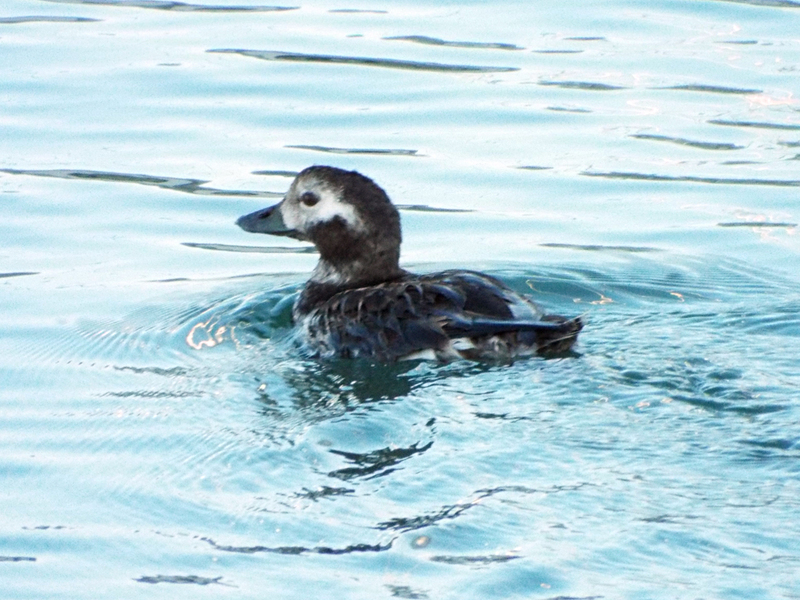 After hawking grasshoppers and other insects for a few minutes along the fence line, the bird flew off a distance onto some power lines, so we left and decided to try and see another reported rarity: a Long-tailed Duck seen near the Canaveral Locks, at the Rodney S. Ketcham Boat Ramp [map]. It took some patience, but the duck finally did emerge from behind some cement pilings and out toward the adjacent marina. 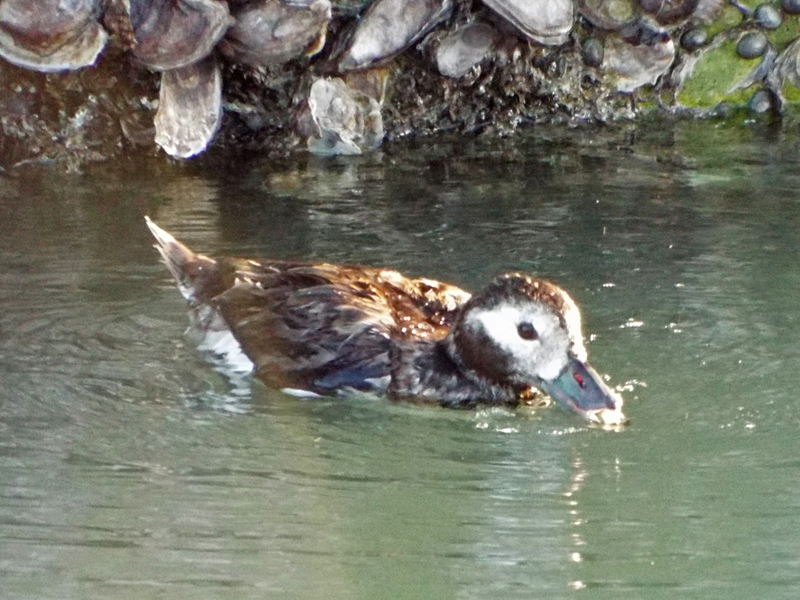 The plumage details and lack of long central tail feathers indicate that this is a female. Bonus bird number two! I’ve seen this species once before, when a male was seen near Parrish Park, under the causeway bridge between Titusville and the Merritt Island National Wildlife Refuge, a couple of years ago. So long, little duck! She started getting annoyed at our ogling and headed for the marina. That ended the daytime activities for the festival. The Florida Ornithological Society didn’t have a booth this year, but I did run into a few members, including Gina and Adam Kent, at the exhibitor area. Most of the usual vendors, organizations, and tour operators were there, including the Florida Wildlife Hospital with their animal ambassadors (Bella, the American Kestrel and Copper, a Red Rat Snake). That just left a night hike with the Enchanted Forest Sanctuary. This was the only night hike I did, and it has always been fun and educational. There were two main changes this year, though. One is that the sanctuary no longer calls owls in. 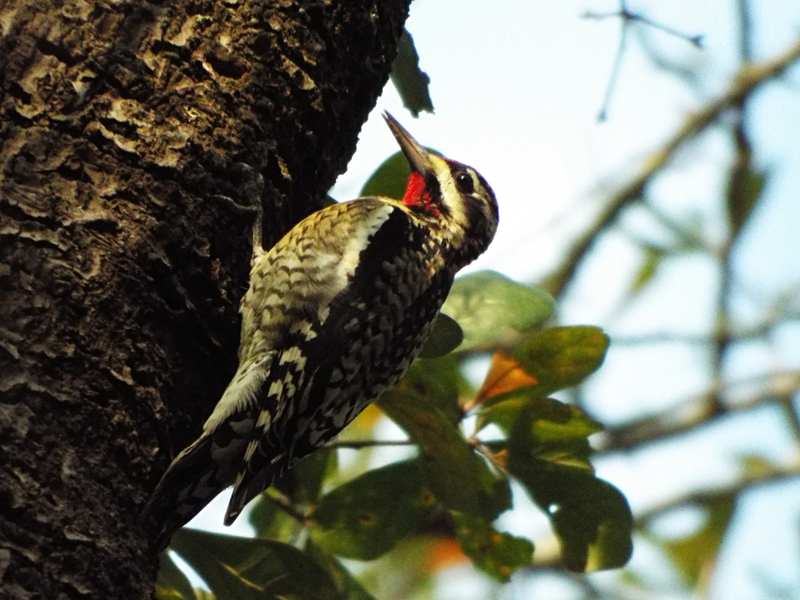 I was mildly disappointed, but there is growing uncertainty as to the ethics of calling for birds in general, with some parks and organizations eliminating the practice. Whatever the specific reasons for not calling owls, the hike was still great fun. The second change was a result of the main Southern Flying Squirrel nest getting blown down during Hurricane Matthew in October. The squirrels relocated to other nests, so they were not easily enticed to the feeder for viewing through a night vision camera. It was a busy and fulfilling day (and evening), with one life bird and exploring a new place (Little Big Econ). Posted on 2017 February 8 2017 February 9 by Lonely BirderPosted in SCBWFTagged Birding, birds, birdwatching, Little Big Econ State Forest, Space Coast Birding and Wildlife Festival.